A Cheesecake, Alsace Style is something very different from the thick and hefty cream cheese cheesecake that New York is famous for. 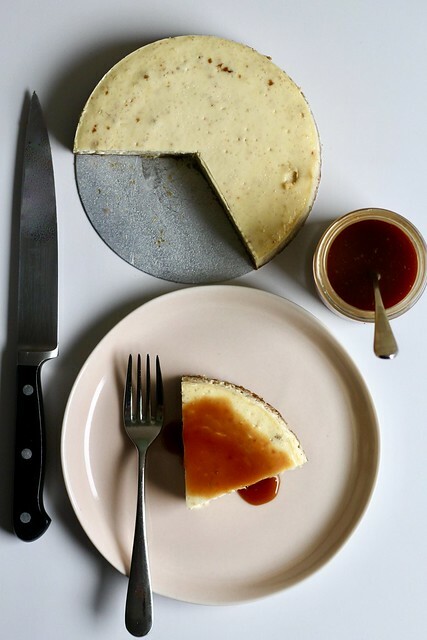 This Alsatian cheesecake is made much lighter with fromage blanc (or a Greek yogurt and heavy cream combo if you can’t find it). 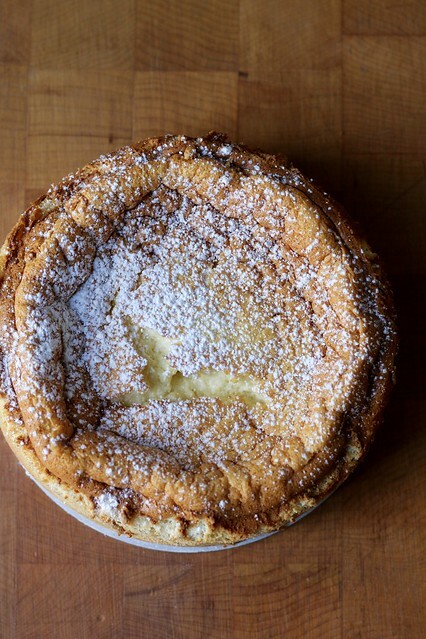 It’s the type of cheesecake that soufflés up in the oven and then falls as it cools. 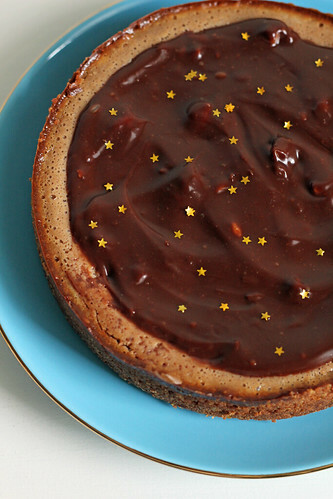 If a dessert can be beautiful and schlumpy at the same time, this is it. The base is a tall galette dough crust, and the fluffy filling is dotted with rum-soaked raisins. I used to be a raisin-hater but I appreciate them now, especially when they get a rum bath! Other dried fruits could be used, of course. And the cheesecake is nice served with fruit, too. I spooned some candied kumquat slices and syrup over the top to dress up my slices. Happy New Year! After the rush-rush of the holidays, things seemed to have returned to normal around these parts. I’m back to my regular days off from work, and even at home, it’s back to my regular living room. I took down the Christmas tree yesterday. Sad, but it was becoming more cactus than pine….so dry and prickly. My vacuum smells like it has a built-in air freshener thanks to all the needles that are whirring around in there. TWD may have made it through the book as a group, but I still have a few recipes left to catch-up on before I can personally say the same. One of them is this Hidden Berry Cream Cheese Torte that was chosen a couple weeks before I joined on. I have been wanting to make this for four years…yes, I’m a little slow to get moving. Since I needed to come up with a dessert for Christmas dinner, I thought it would be a good opportunity to finally try it out. 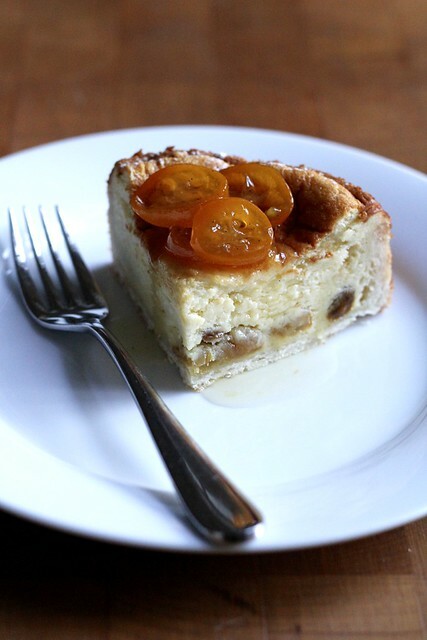 I liked telling my dinner guests that we would be having a “torte” after dinner…made it sound super fancy and exotic. But this really is a familiar dessert–a slim and elegant cheesecake. 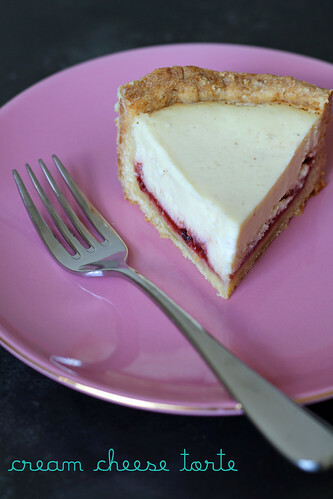 It had the extra step of making a dough crust (rather than a crumb one), but the cheesecake batter itself was simply whizzed in the food processor. That’s my favorite way to mix cheesecake batter, actually, because you never get any lumps. A layer of jam hidden in the middle (I used some of my homemade plum jam) made a nice surprise when I cut the first slice. Because it wasn’t t four inches tall like a NY-style cheesecake, I didn’t feel uncomfortable eating it after a big dinner. This recipe was so nice, I made it twice! I had to make up for that whole four years late thing, I guess. Since, I’d made a half recipe the first time, I still had half the ingredients remaining to do another small cake. For the second go-round though, I put my own little twist on it. 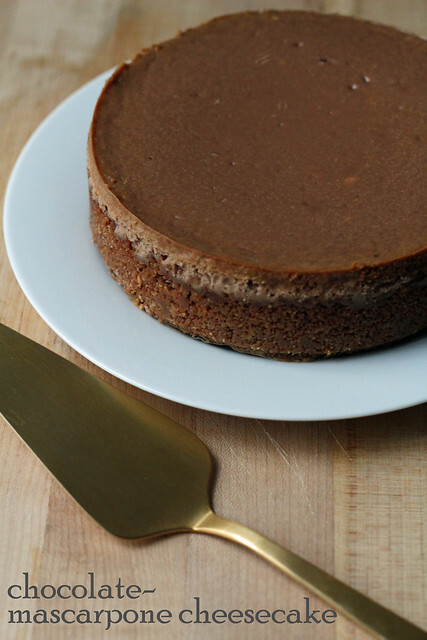 This time I used a crumb crust (made from some gianduja cookies I took home from work because we…ummm…screwed them up…it happens sometimes). And instead of spreading on a layer of jam, I mixed a couple tablespoons of nutella (really a single packet of Justin’s) into the batter. I didn’t know how intense the flavor would be, so topped it off with a little hazelnut ganache, which also handily disguised the little crack that formed in the middle. It was New Year’s Eve, so I tossed on some stars. -Butter a 9-inch springform pan, dust the inside with flour and tap out the excess. Place on a baking sheet lined with parchment or a silicone mat. -Put the flour, sugar and salt in a food processor and pulse just to blend. Toss in the pieces of butter and pulse until the mixture resembles coarse meal. Stir the egg yolks and vanilla together with a fork, and, still pulsing the machine, add them and continue to pulse until the dough comes together in clumps and curds – restrain yourself, and don’t allow the dough to form a ball. -Turn the dough out onto a work surface. If you want to roll the dough, gather it into a ball, wrap it in plastic wrap and refrigerate it for about 20 minutes before rolling. Or simply press the dough into the pan. The dough should come about 1 1/2 inches up the sides of the springform. Refrigerate for at least 30 minutes. -Center a rack in the oven and preheat the oven to 375°F. -Fit a piece of buttered aluminum foil against the crust, covering it completely. Fill the crust lightly with rice, dried beans or pie weights and slide the sheet into the oven. Bake the crust for 20 minutes or so – you don’t want the crust to get too brown. Transfer to a rack to cool while you make the filling. -Lower the oven temperature to 350°F. -Stir the jam, and spread it over the bottom of the crust – it’s okay to do this while the crust is still warm. -Put the cream cheese and cottage cheese into the food processor and process, scraping down the sides of the bowl a few times, for 2 minutes, until you’ve got a smooth, satiny mix. Add the sugar, salt and spices and process for another 30 seconds. With the machine running, add the eggs and process, scraping the bowl as needed, for a final minute. Pour the filling over the jam. -Bake the cake for 60-70 minutes, or until the filling is uniformly puffed and no longer jiggly. Gently transfer the springform pan to a cooling rack and allow the torte to cool to room temperature, during which time the filling will collapse into a thin, elegant layer. -Run a blunt knife between the crust and the sides of the pan, then open and remove the sides of the springform. If the sides of the crust extend above the filling and you don’t like this look, very gently saw off the excess crust using a serrated knife. Chill the torte slightly or thoroughly before serving and, if you’d like, dust the top with confectioner’s sugar. Wrapped well, the torte will keep in the refrigerator for up to two days.